I pulled that disappearing act again, and I’m sorry. I was doing so well, too! Thank you for your patience with me. I had some problems with my left hand, which is my dominant hand. Specifically, I had carpal tunnel syndrome with nerve damage in the thumb. For a while now I’ve had some pain in my hand when drawing, but only after two-three hour drawing sessions, and it wasn’t too bad, so I didn’t worry about it. But starting a couple of months ago, my thumb was going numb after two minutes of holding a pencil. The bad news is that I haven’t touched my colored pencils since the numbness started. I’m too much of a wimp; even now that my hand feels better I fear what I’ll find. But then the good news is that I’ve had good results drawing on my iPad. It’s even better in some ways! I erase mistakes instantly, and I can use layers to refine my drawings. So I don’t think this is the end of my colored pencil days, but no matter what, I’ll still be able to draw. Before I got the brace, I was using it to work on the iPad app Brian and I are making slow progress on (which I’ll talk more about in a second) and I was really happy with what I was able to do. Brian and I are working on two iPad apps, albeit slowly.. One is a basic app that will let you dress up Grace and Ivy with all of the dresses that fit them, and the other will be a princess-themed doll app with all new artwork and lots of customization options. Neither are really anywhere near completion, but we’re working on them! 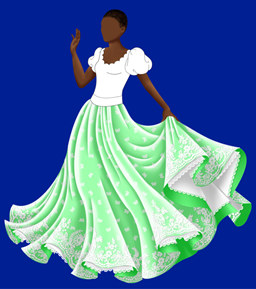 The image to the left is a screenshot of how the skirt would look with a white lace overlay. I think it looks lovely, but as you can see there’s so much still to do. But work takes up most of his time, and I take care of the little guy and have also started working as a translator for Cookpad, which is a very popular Japanese recipe site that recently launched an English version. If you have any interest in Japanese home cooking, or even just in yummy, pretty food, please check it out! As for this site, I don’t anticipate going back to colored pencils any time soon, so I will stick to digital coloring. I’m dissatisfied with the contrast between Grace and Ivy, done in colored pencils, and the new, digitally colored outfits, so I think my next step for this site is to draw a new doll. That’s never my favorite step! But I’m working on it. That will probably be the next thing you see up here. Milo is doing well; he’s 18 months now, and he’s growing up beautifully! His hair is finally getting long, and it fans out in cute little wisps above his ears. He’s allergic to tree nuts; we found that out the hard way. But otherwise, he’s just a healthy, cheery, inquisitive little guy who points at everything that catches his interest and loves his mama and dada. If you would like to keep track of what I’m doing, you have several options! You can join my mailing list by entering your e-mail address in the box at the top right of the page, and I will e-mail you whenever I update. You can also follow what I’m doing on Facebook and Twitter. I haven’t updated either of them much, since I haven’t really wanted to talk about my hand, but I will try to be better with it!